Step into a sales center at one of dozens of new real estate projects scattered throughout South Florida, and you enter a brightly lit, make-believe world of staggering views and designer interiors — often even before a shovel digs into the ground. Tablet touch-screens that allow buyers to stand on a vacant home site and see a floor plan unfold, complete with an outfitted kitchen and furniture layout. A three-dimensional, animated film that takes the viewer on a walk through the marble-clad lobby and into the units of a condo tower yet to be built. A 10-foot-tall light wall that mimics the exact waterfront view from a future apartment window. Once relying on architectural drawings and floor plans, paint chips and cabinet designs, today’s sales centers are now worthy of an Epcot exhibit — some even with Disney-esque holograms. From the wattage of the lights to the scents in the air, sales centers for new homes have evolved, orchestrating a feeling of not just what your new home will be, but who you will be once you buy it. Nowhere is that more evident than in the galleries that hawk multimillion-dollar condominiums to the international jet set. “Let’s face it, we’re selling the dream,” said Edgardo Defortuna, president and chief executive of Fortune International, seated in the “experience room” in Jade Signature’s glossy new sales center. A full-screen movie — available in five languages — shows 3D animation, putting the viewer inside the futurist 192-unit tower. Designed by Herzog & de Meuron, the tower features pre-construction condos with prices ranging from $1.7 million to $26 million. “Nothing is really built yet, so we have to be able to show the customer who isn’t used to imagining it or envisioning it,” Defortuna said of the technology at the Sunny Isles Beach sales center. Nearby, one full wall shows the ocean surf behind a full-scale outdoor terrace as the sound of crashing waves plays in the background. Some condo sales centers, like Marina Palms Yacht Club & Residences in North Miami Beach, use Apple TV. The touch of a button on an iPad allows a buyer to zoom in on a condo unit, see the price, size, floor plan, location and view. It can all be propelled onto sales center screens. “It takes selling pre-construction to the next level,” Michael Internoscia, director of sales at Marina Palms, said as he demonstrated the system inside a conference room at the Marina Palms sales center. The development’s two waterfront towers will have a total of 468 units, priced from $750,000 to $4.5 million. Marina Palms, as well as Biscayne Beach in Miami’s East Edgewater neighborhood, are among the developments using photos taken from helicopters to show buyers prospective views. Biscayne Beach has a 50-foot-long, 10-foot-tall light wall that mimics the view of apartments that will look out over Biscayne Bay and Miami Beach. The wall is made of LED lights projected onto printed fabric. Video walls also tell the story at Echo Brickell, a Brickell Avenue development by Property Markets Group. The seven-foot-wide array of 55-inch LCD panels at its sales center shows an ultra-high-definition video of the view from a condo at various times of day. Similarly Oceana Bal Harbour, a 28-story, 240-unit condo designed by Arquitectonica, offers a movie and a separate model room with four walls of screens. Unit details can be projected onto a wall in other, more private office settings. One Thousand Museum, designed by Zaha Hadid, takes the virtual experience a step further, with a 3D hologram rendering of the future tower near downtown Miami. The sales gallery also features a Hadid-designed, 120-foot ceiling art installation. Futuristic furniture, wallpaper and even doorknobs are also designed by Hadid. The Ritz-Carlton Residences Miami Beach has two holograms showing an animated creation of the project, embedded in a 36.6-foot-wide, 15.5-foot-tall exhibit wall. The holograms are alongside videos, photos and a diorama of the project, which will have 126 units priced from $2 million to $25 million. “Our goal here is to create an experiential environment that is very cutting edge,” said Laurie Ingber, co-owner of Premier Sales Group, the project’s exclusive sales agent. As part of selling the lifestyle, the atmosphere of many sales centers — often referred to as ‘sales galleries’ — is also a step above. 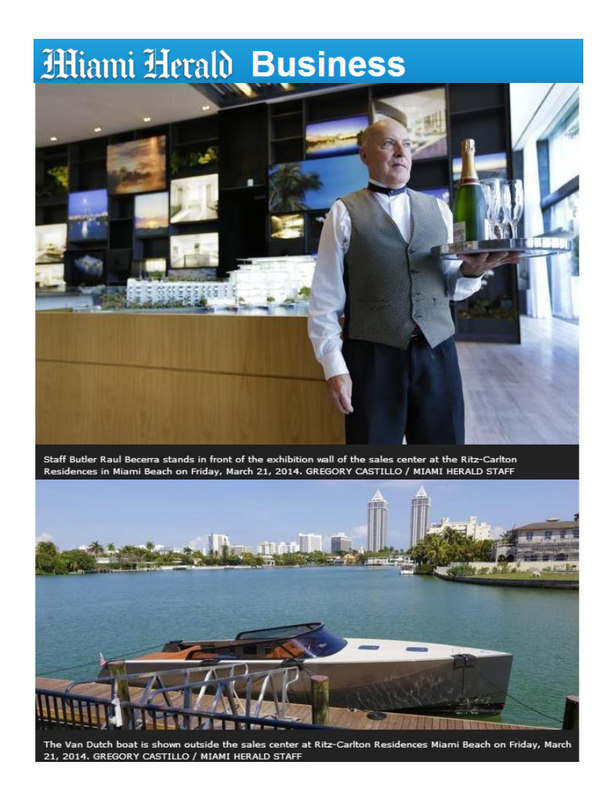 At the Ritz-Carlton Residences, a VanDutch boat, docked outside the sales center, can take prospective buyers around Surprise Lake as part of the overall experience, said Ricardo Dunin, founding partner of Lionheart Capital, the developer of the project in Mid-Miami Beach. A butler is at the ready to attend to visitors. Breakfast and lunch can be served, and a happy hour event is held each week. It’s all part of getting buyers to experience the lifestyle of Ritz-Carlton, where the boat will be at the disposal of owners. Indeed, upscale events are key to setting the tone and appealing to high-end tastes at sales centers. At Jade Signature’s sales gallery’s opening reception, servers passed champagne and canapes as revelers mingled amid a display of sparkling Chopard jewels worn by actresses at the Oscars, brought in just for evening. Beyond the condo towers on the bay and ocean, sales centers for new home developments also have evolved, creating the feeling of how a new home may look. During the past few years, Lennar Homes has created “Lennar InSite” digital tools that include touch screens that show dynamic floor plans and furniture layouts. Then, when customers leave, they are given a personalized brochure containing the home site they liked most, the floor plan and all the dimensions, he said. Other developers have jumped back into the home-building business in the past two years, buying up land and gussying up sales centers that were quiet during the recession. In January, GL Homes debuted its sales center at Valencia Cove, a new 55-and-older community west of Boynton Beach. Toll Brothers is working on a revamp of its Jupiter Country Club sales center, which opened at the peak of the market in 2006 but has seen most of its activity in the past two years. The introduction of technology has been the key change in home center design, said Linda Cohen, vice president of marketing for the Pennsylvania-based Toll Brothers. This report was supplemented with information from the Palm Beach Post.